On Tuesday afternoon, Rosamita’s father came back as he had promised, with her birth certificate and health care records. 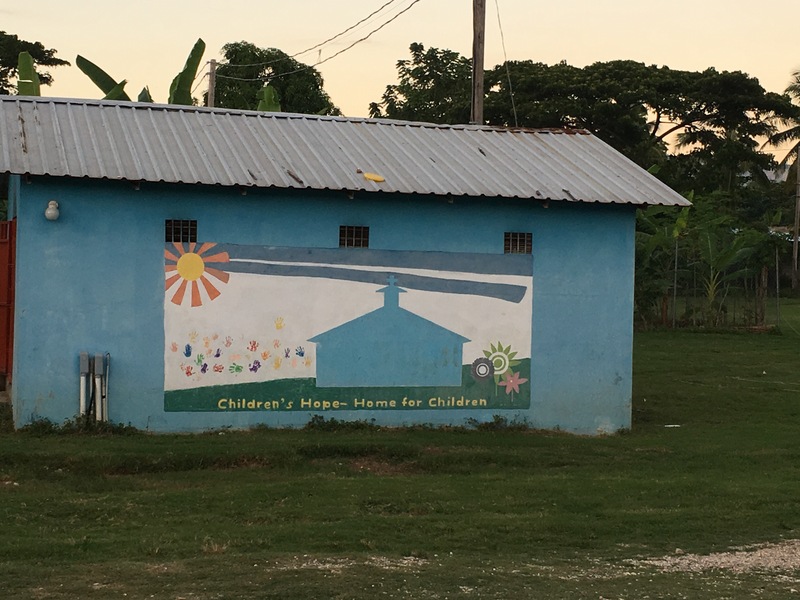 We took him and Rosamita to meet with Henry, the director of Children’s Hope Home, at 4:30 p.m. As soon as we entered the compound, we experienced love, joy and peace. We were welcomed by the children, who were very happy, clean and, most of all, loved. There are 50 children who are in this home that was begun after the earthquake in 2010. 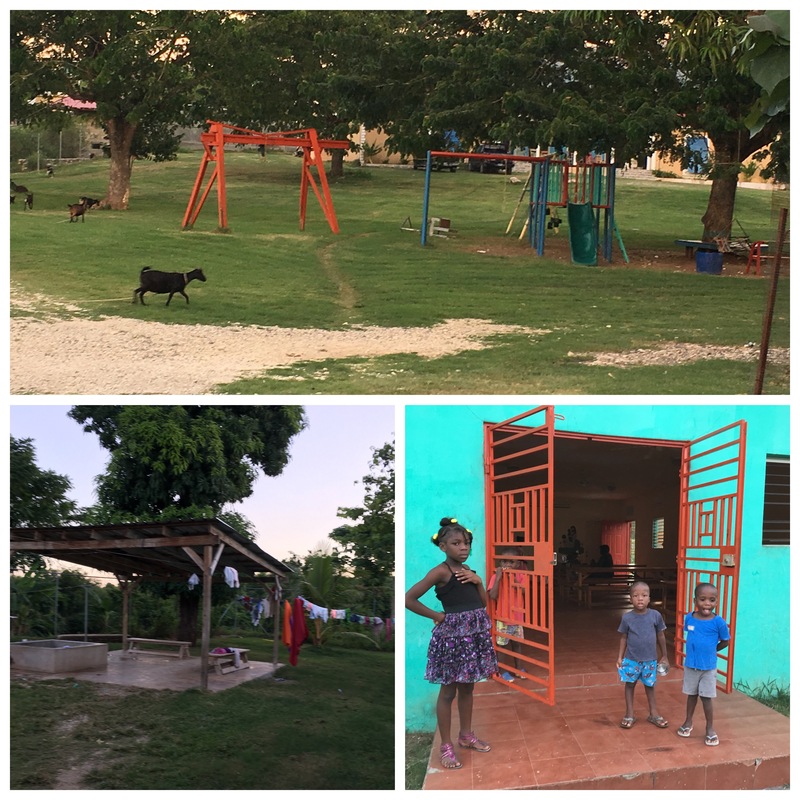 They have healthcare facilities, a school nearby, and a large piece of land for the children to play, learn and grow. Every week, they have Sunday services on the property. Children’s Hope is the orphan ministry of First Baptist Church, Montgomery, Alabama. Based on James 1:27, it encompasses Foster Care, Adoption and Orphan Care. The mission of Children’s Hope is to engage the Church in carrying out God’s command to care for orphans. Christella came to the house today and knew what had happened yesterday. We feel she does understand the situation and knows that Rosamita needs daily care and love. Please pray for both parents and little Rosamita. 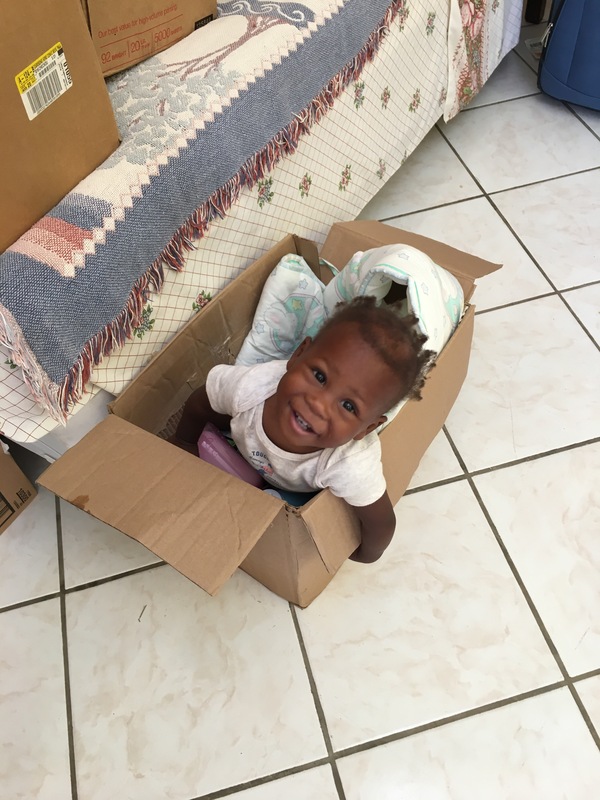 You may remember, from this past year, we shared a story about a 15-year-old teen, Christella, who had a baby girl a year ago in November. She named the baby Rosamita. During the year, Christella had tried to care for her baby, but there were many times Christella would disappear for days. She would leave little Rosamita with the father who could not care for her. 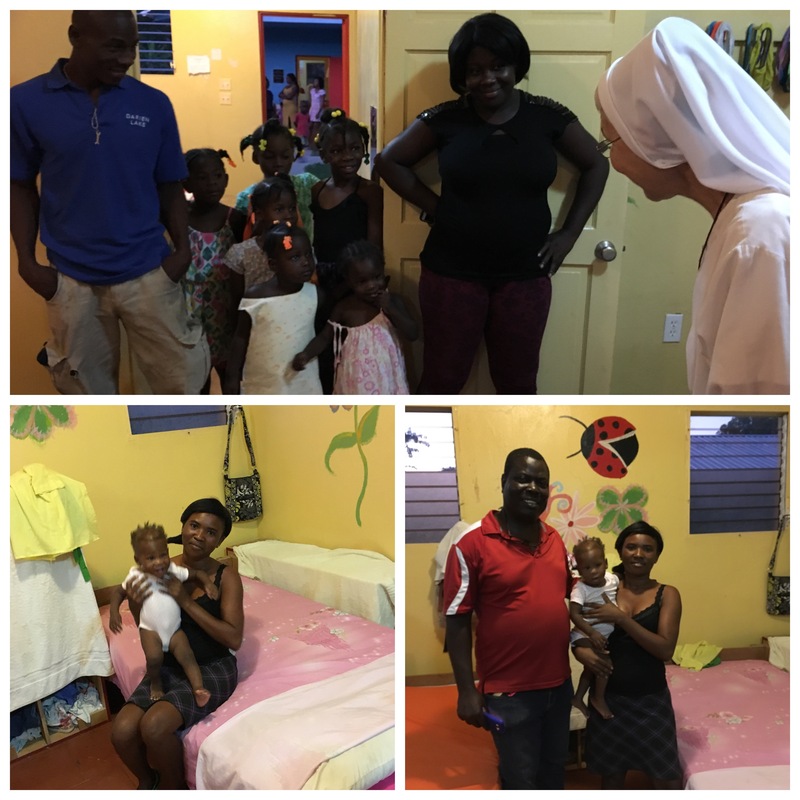 We tried our best to care for the child’s needs, providing diapers, baby milk, clothes and other necessities. Sometimes these things would be missing, and we would find out they had been sold for money. This past Monday, late in the afternoon, Rosamita’s father brought her to us in a panic, with tears in his eyes. He said he could not care for his daughter and would need to put her in a home that would care for her. 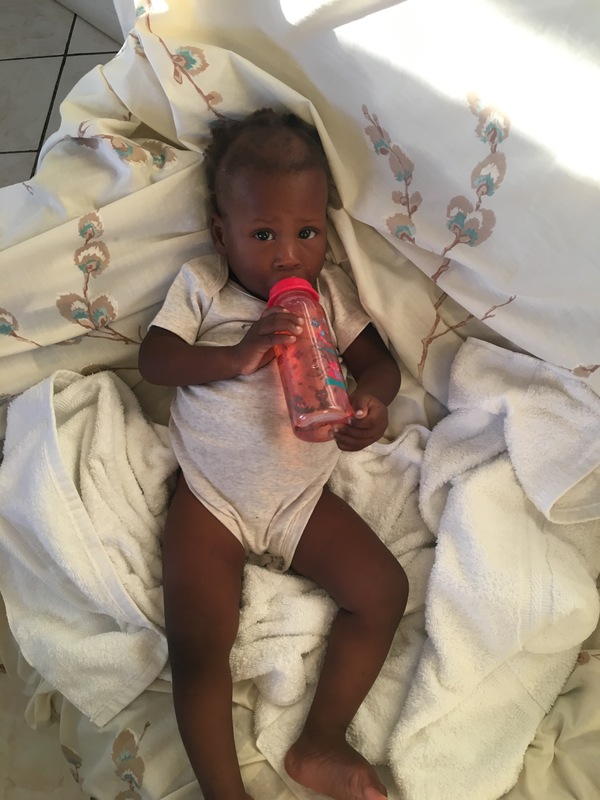 Christella had once again left her baby with the father and had disappeared for a week. The baby was so hungry and dirty. Right away, we fed and bathed Rosamita. Her father was so stressed that we took her for the night so he could go to find work in the morning. For the first time, after being fed, bathed and cared for, little Rosamita was smiling and laughing. 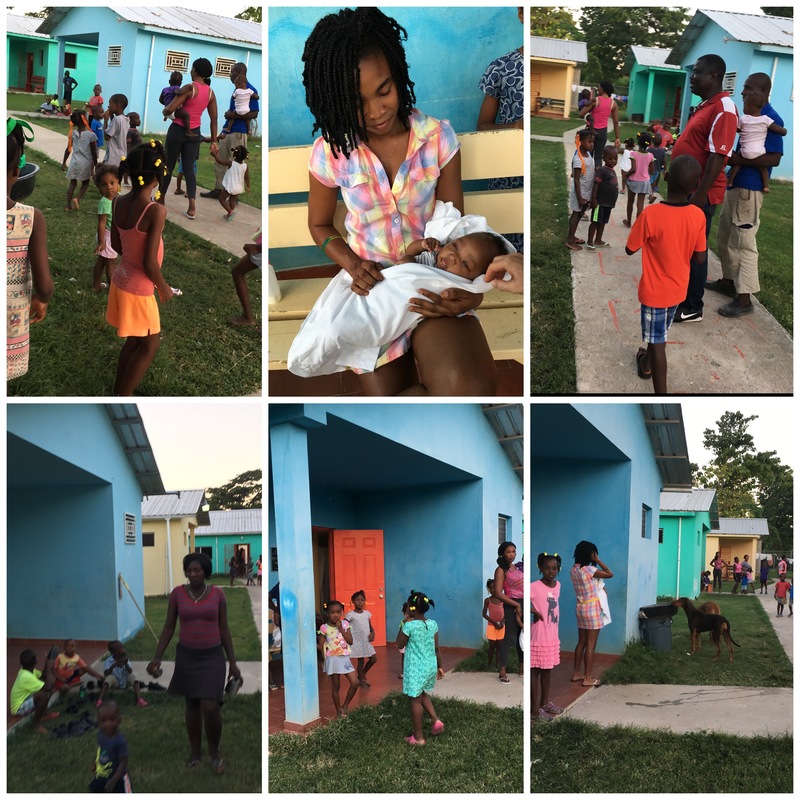 We made a few phones calls to people who help children in such situations, and we had an appointment with Children’s Hope Home for Children here in Jacmel the next morning. This is the second year that we are teaching the minor seminarians English. Last year, we had a group of twelve. 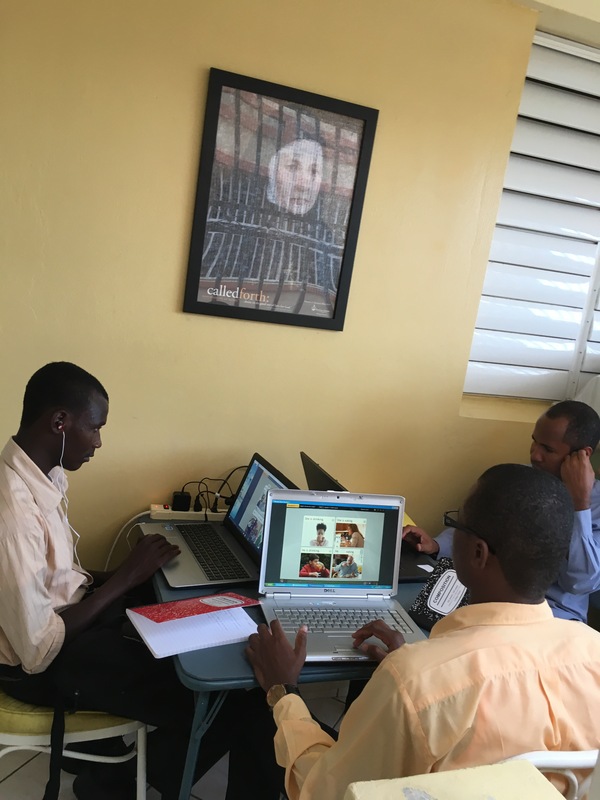 They all have been accepted to the major seminary in Port au Prince. This year, we have two seminarians. Father Valery, their director, is also taking classes. We have conversation, and then they work on the computers, using the Rosetta Stone program. 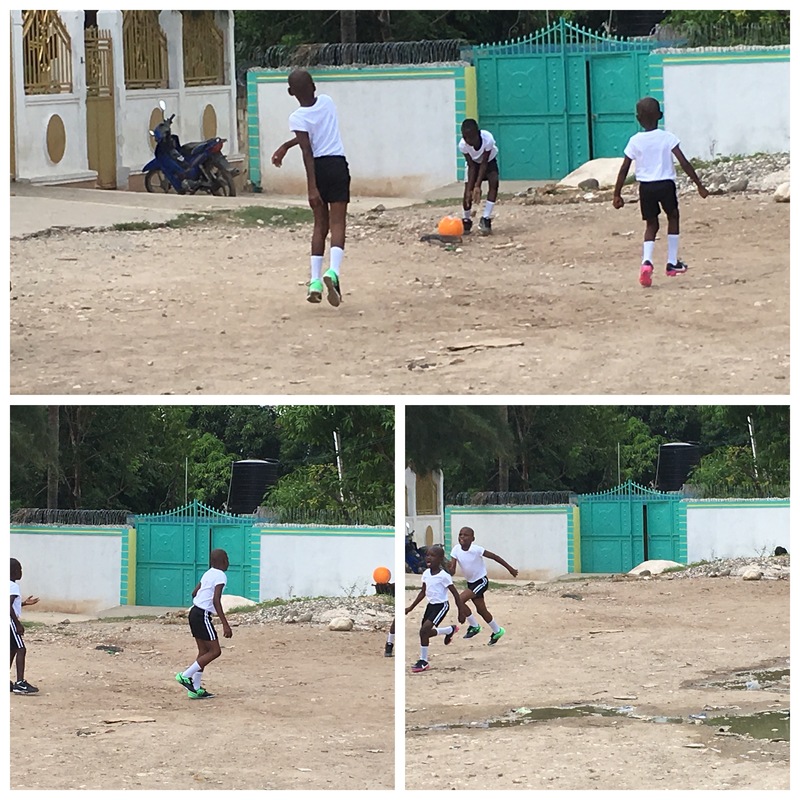 Our young boys have their soccer uniforms and shoes! 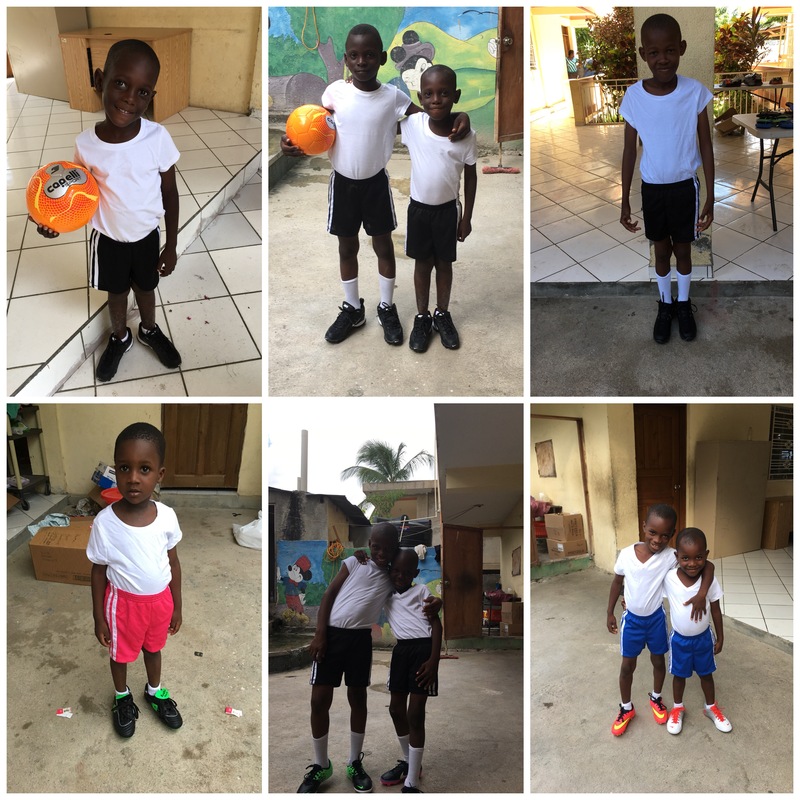 Thanks to our friends at St. Gabriel’s Parish in Saddle River, NJ, and the Archdiocese of Newark Youth Center, Kearny, NJ, our young boys got to look like a real soccer team with new soccer shoes, shorts and shirts. They also have a new soccer ball to call their own. As you see from the pictures, they are ecstatic. Thank you to all for putting joy in their lives. 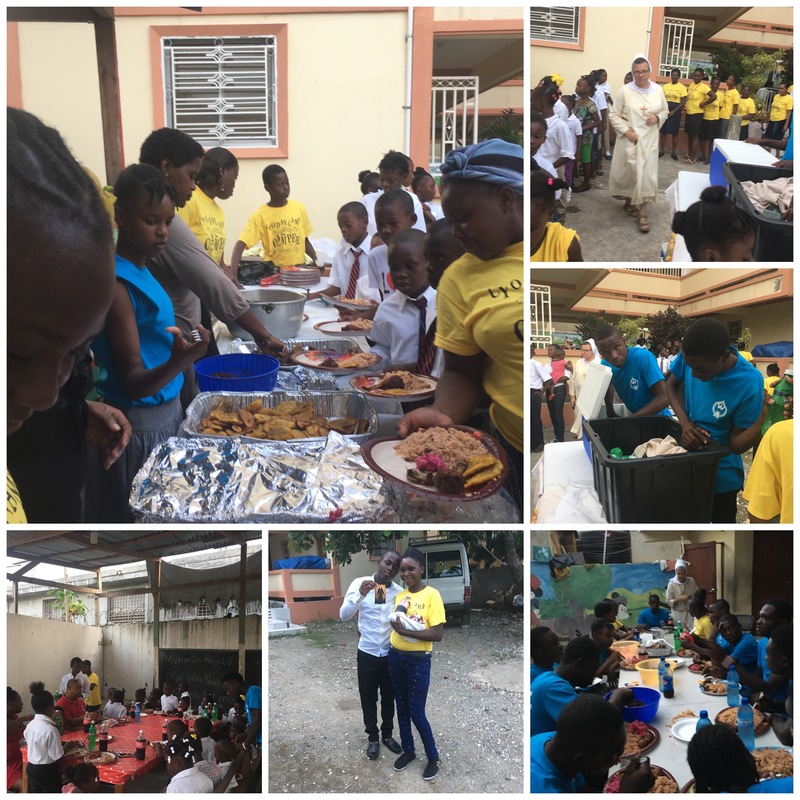 We had a very beautiful celebration for our founding day, celebrating Blessed Mary Angela on Saturday, November 19, with our kids, teens and the people with whom we work. We hosted over 125 people and, if anything could go wrong, it did. It started when Dr. Wanitha, who works in our clinic, called. She was very sick, and she was suppose to give a witness, sharing her experience visiting Poland and walking in the footsteps of Blessed Mary Angela. Then came the next bad news: we have been having trouble with our inverter that provides electricity when the city doesn’t. It was overheating. We had our electrician come, and he tried to fix it; but then came the moment when he looked inside. It was burned! This was right before we were ready to celebrate with the presentation and Mass. By a stroke of luck, about 10 minutes before program, the city electricity was on, so we were able to use the projector and computer. We had prepared a slide show, telling the story of Blessed Mary Angela. At the same time, our electrician showed us and told us the nightmare of the burned inverter, and he told us what it would cost for a new one. This can be purchased in Port au Prince, but would not be installed until next weekend. So that means no electricity, no use of oven, no Thanksgiving dinner. We pray we will not lose the turkey we have in the freezer now. The good news is that the city puts on electricity at various times during the day and the night for a few hours. Back to our beautiful celebration. The priest that we always have for our Saturday Mass with our people was not here when we started at 2 p.m. He had said he would be there, so we called him and were told he needed a ride. We were surprised because he never needed a ride before. What more could go wrong? 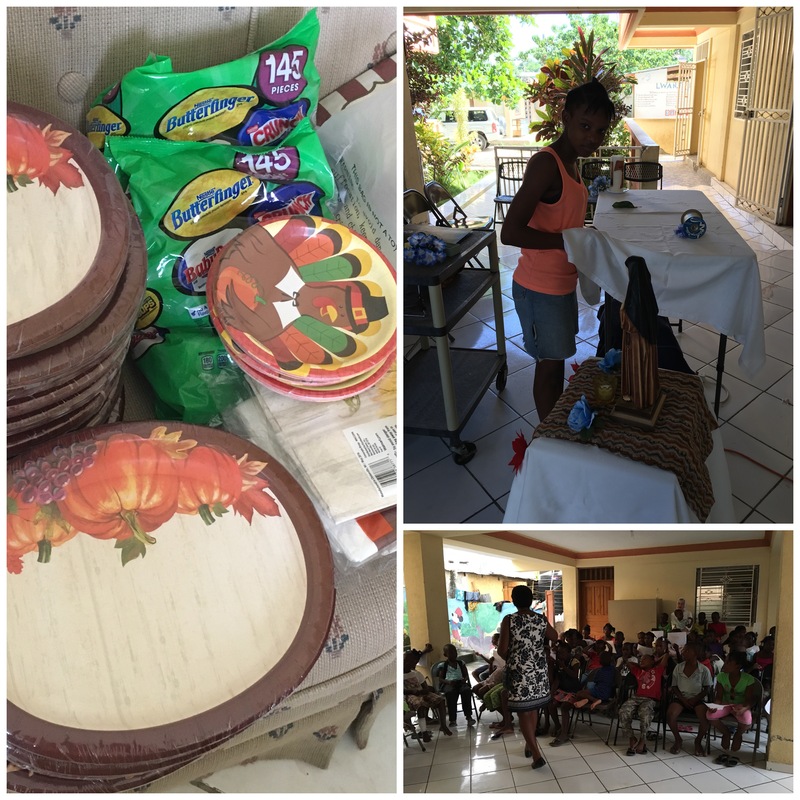 When we had everything ready–decorations, table cloths and food on the tables–we had a 10-minute downpour of rain. The table cloths got drenched. They were special Thanksgiving ones. We covered the food with plastic and waited for the rain to stop. We prayed we would have enough food and, thanks be to God, we did. That was through the intercession of our Mother Angela. The kids sang beautifully, and the songs were perfect. 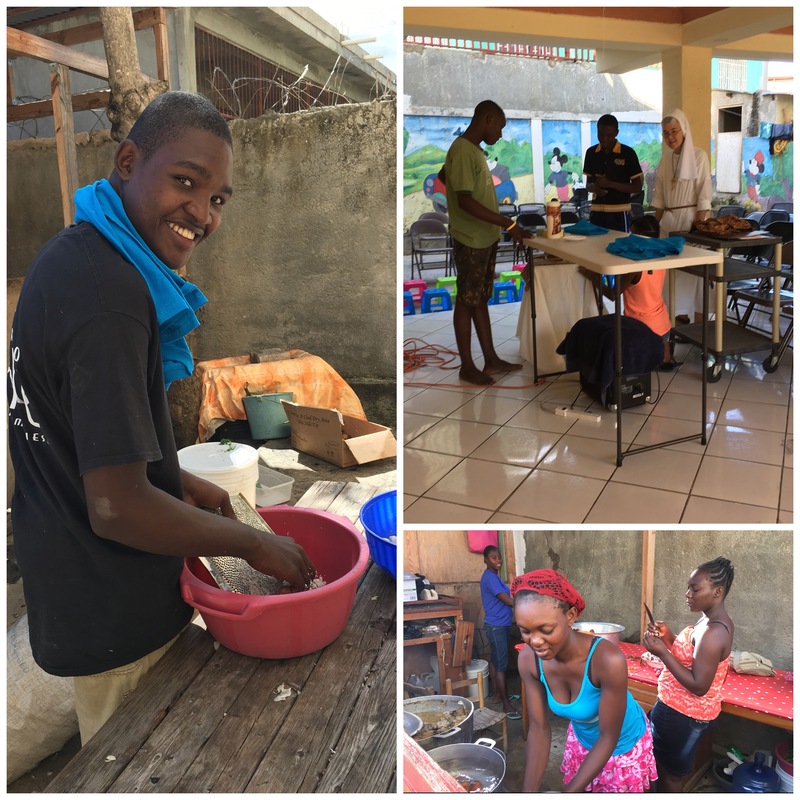 Our teens had helped, and we gave them special shirts that identified them as our volunteers. When the Mass finished, and we had the feast, the city electricity went off–perfect joy! 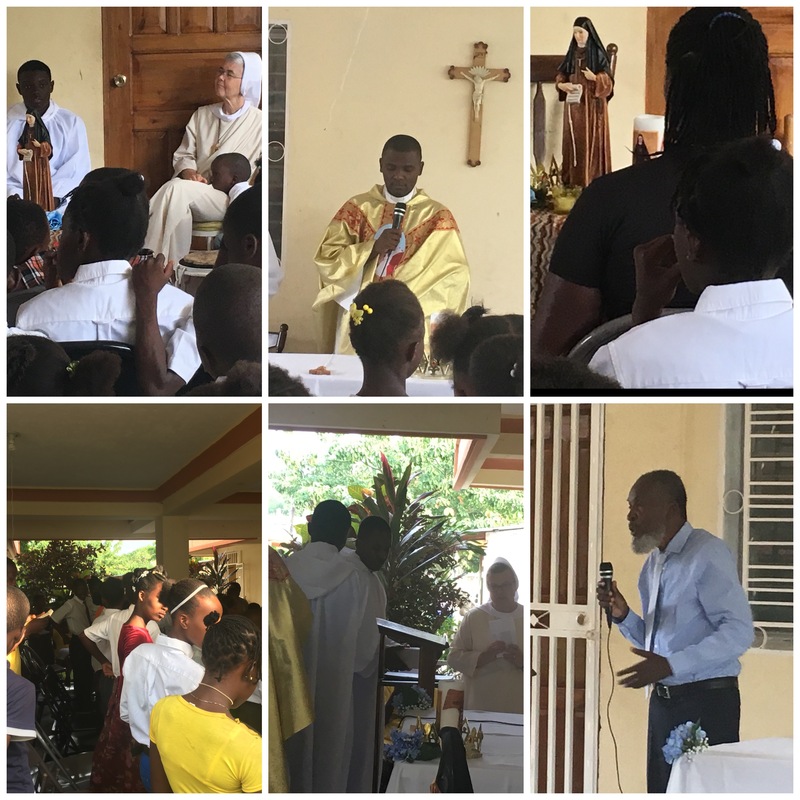 Dr. Yves Derisier, the director of the Mother Angela Clinic, spoke to everyone at the end of Mass about the mobile clinic and the work they do for the people in the Diocese of Jacmel. Everyone loved the celebration and the food! In Jacmel, at 5 p.m. it starts to get very dark. With no lights, this becomes a problem; but with candles and phone flash lights, we were able to clean up as best we could. Then our phones died! 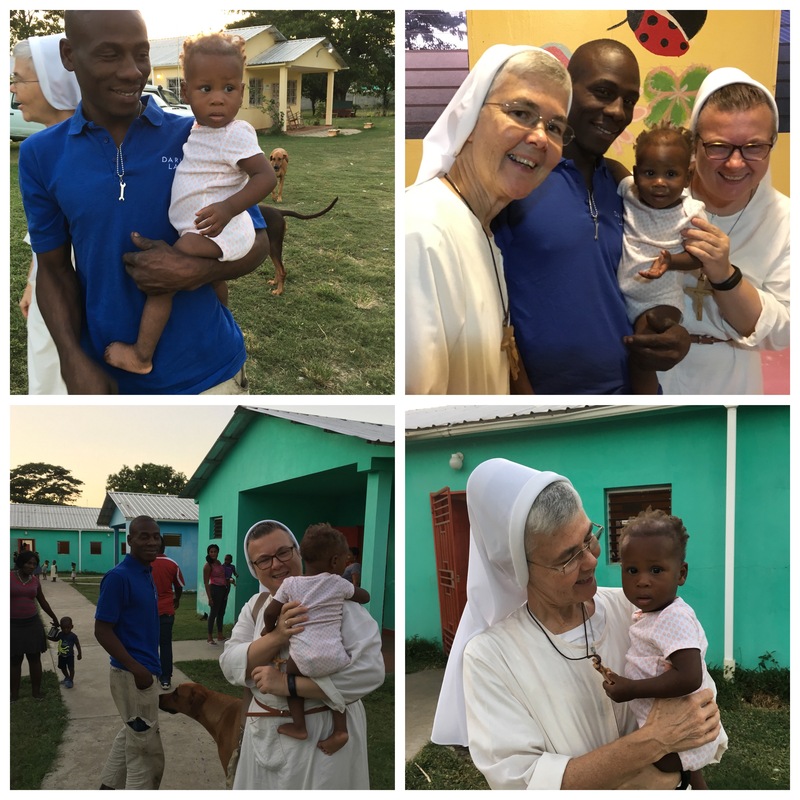 Yesterday was a blessing and something we had always wanted to do here in Jacmel, especially with our poor–celebrating the legacy of our dear Mother Angela and our founding day. Today we have elections for the new president of Haiti. This means possible demonstrations and violence, so on Monday everything is closed for the safety of the people. Praised be Jesus Christ our King! Happy Feastday! In the mornings of Friday, November 18, and Saturday, November 19, our place was very busy as we prepared to celebrate the Founding Day of the Felician Sisters. 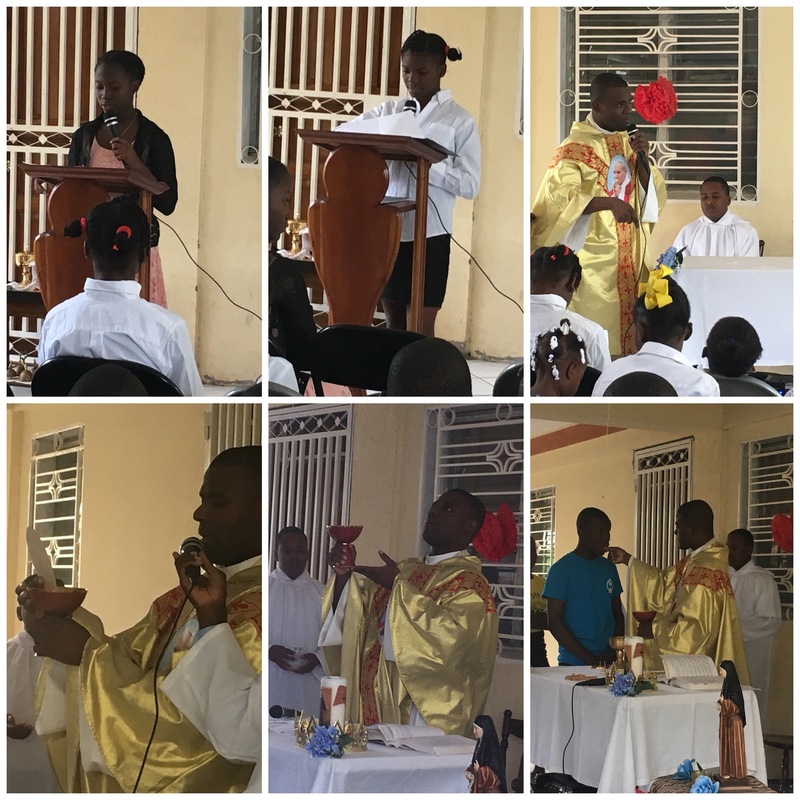 Even though our feast is on November 21, we decided to celebrate on the 19th since it was the day before the Feast of Christ the King, and we always have a community Mass for our people on Saturday afternoons. 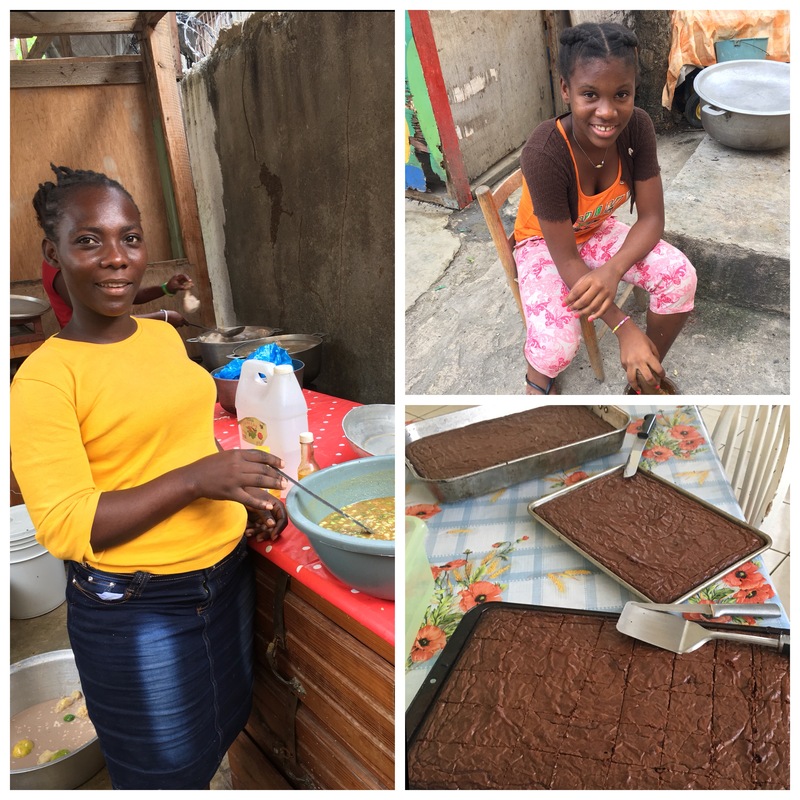 We found ourselves baking over 125 brownies, shopping for chicken, vegetables, soda, and some last-minute items needed for the fet. 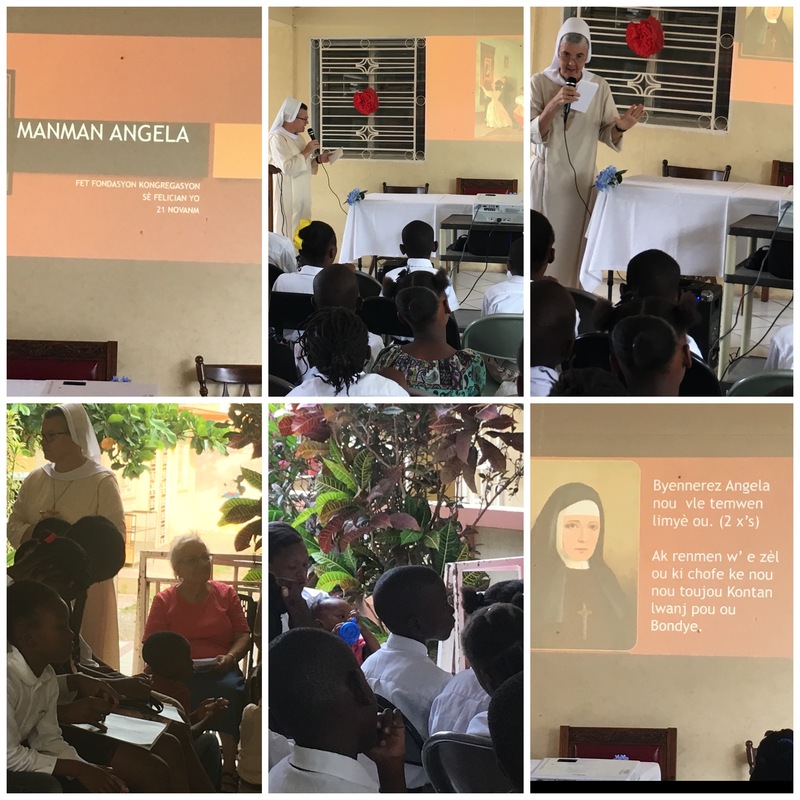 We had singing practice with the kids, decorated and prepared the altar, and worked on a PowerPoint presentation to share the life and mission of Blessed Mary Angela. It was a joy to see so many of our people join in the preparations. 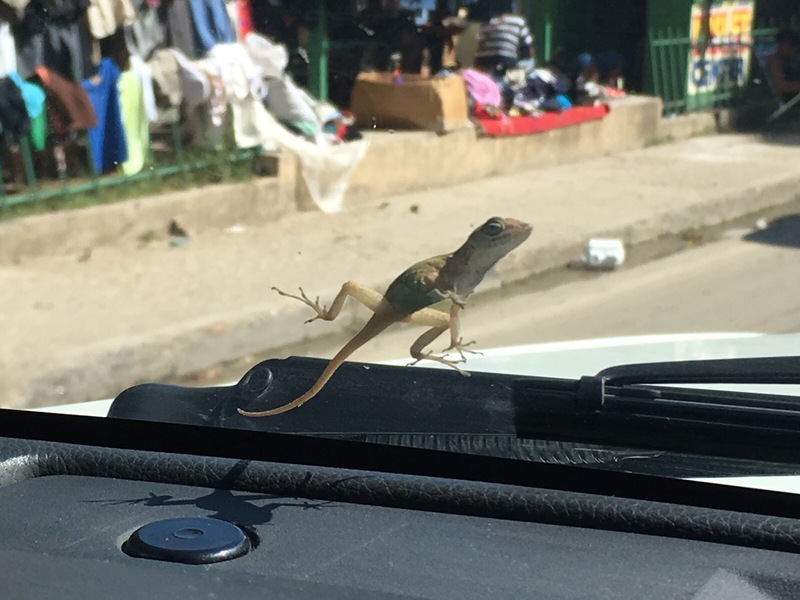 This little guy wanted a ride and was on our windshield for the longest time as we made some errands in town today.